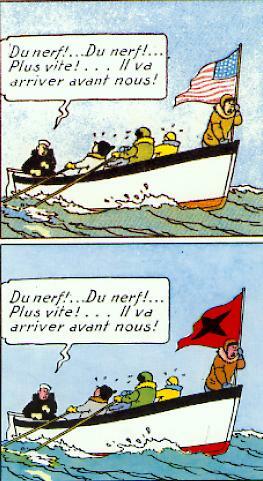 The Shooting Star (Original: L'Étoile mystérieuse) is the tenth comic of the Adventure of Tintin series. 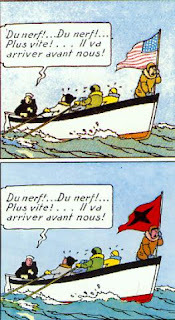 This was the first comic of Tintin that originally published in color. This was the second book published during German occupation of Belgium. The comic published daily in Le Soir from October 1941 to May 1942. This is one of the most criticized comic for Anti-Semitism. The comic re-published in 1954 with making various changes to the story to make it more Jew and US friendly. This should be the first science fiction Tintin comic. "It's the END of the WORLD!" declares Professor Phostle, as an enormous star hurtles towards the earth. But he is disappointed - the star brushes past, leaving only a vast meteorite which falls in the Arctic waters. However, there is no mistake about the Professor's discovery of a valuable new metal in the meteorite; it is worth a colossal fortune, and in a hazardous search in polar regions Tintin, Snowy and Captain Haddock encounter some of their strangest adventures. Its a race between a European crew accompanied by Tintin and an American crew financed by unscrupulous villains for the mysterious meteorite as the prize. Here Tintin is not a reporter at all.